Writing from a personal experience with honesty, warmth and compassion, Meredith Seafield Grant explores eating disorders, the development, the depths of despair but most importantly the hope and reality of recovery. With over twenty years of personal journal entries as a resource, Meredith has compiled the wisdom and insight she gained on the road to her personal life’s rainbow. Appreciating that each individual suffering from an eating disorder requires a personal prescription for recovery, Meredith has written this book in hopes that something on her road to recovery may help other sufferers. And above all… there is hope. Eating disorders are misunderstood, massively destructive illnesses robbing mostly young women of their health, spirit and future. It is estimated that over six million women and half a million men have a clinical eating disorder at some point in their lives. While there is a wealth of literature on the biopsychosocial understanding of the disorders, little has been written on the process of recovery. We have much to learn from these accounts, and Meredith Seafield Grant has written a triumphant one. Meredith has beaten many of the odds that were against her. Her early experience of sexual abuse, repeated hospitalizations and “treatment failures”, the chronic course of her illness, the multiple symptoms of anorexia, bulimia and over eating all would have discouraged professional and personal supporters. Yet Meredith has succeeded in reclaiming her health, and lives a full and productive life. 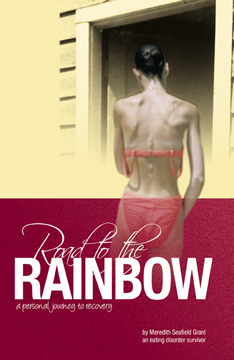 Road to the Rainbow: A Personal Journey to Recovery from an Eating Disorder Survivor is a testimonial with many of the good qualities of a testimonial, and none of the bad. Meredith’s story does not glamorize eating disorders, nor does it sensationalize the extremes in behaviour that often incite others to compare and compete. Instead, Meredith focuses on the day to day moments and strategies that have lifted her forward step by step, so that today she can say with confidence that she is recovered. Meredith starts with hope, and humility and gratitude. Her story is not a “fix” for everyone, but her experience will have something for everyone searching for a way out of an eating disorder. She states that recovery is a process, a process of self-expression that is facilitated by all manner of experiences. For Meredith it involved a hunger strike, self-disclosure, admitting there is a problem, and above all honesty: honesty with a close therapist, her family and friends, and herself. Meredith’s story is filled with intentional steps toward rebuilding a sense of self. The emerging person that Meredith becomes defends a positive attitude and making careful choices, all leading toward health. Exceptional is her account of the use of affirmations, alternative mind/body therapies, journaling, and taking care of her environment. This book is filled with a fierce sense of determination, optimism and tenacity. As Meredith quotes, “There never was a rainbow without a fall of rain.” It is her time for the rainbow; there has been enough rain. Meredith Seafield Grant is an eating disorder survivor and now counsels those suffering from eating disorders as well as their families on their own personal journey to recovery. She also gives presentations to assist people understand the distorted body images presented in the media that adversely affect today’s youth. Mention the title, author and ISBN 978-0-9809191-7-2.